Chemical reactions thought to be impossible in space because of the extremely low temperatures there are actually happening often. In a July 2013 study, researchers suggest a strange phenomenon called quantum tunneling is the explanation. 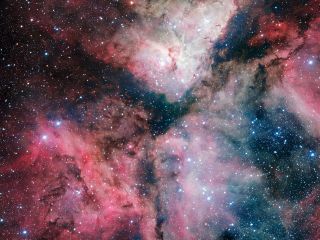 A weird quirk of quantum mechanics is allowing a chemical reaction thought to be impossible to occur in cold gas in outer space. In the harsh environment of space, where the temperature is about minus 350 degrees Fahrenheit (minus 210 degrees Celsius), scientists had thought a certain reaction involving alcohol molecules couldn't take place, because at such low temperatures, there shouldn't be enough energy to rearrange chemical bonds. But surprisingly, research has shown that the reaction occurs at a rate 50 times greater in space than at room temperature. Now, by simulating the conditions of space in a laboratory, scientists have found a possible explanation for how the reaction occurs: quantum tunneling. This tunneling ability might allow particles to undergo chemical reactions that should be impossible due to the lack of energy at the low temperatures of space. "The answer lies in quantum mechanics," chemist Dwayne Heard of the University of Leeds in the U.K., who led the research, said in a statement. "Chemical reactions get slower as temperatures decrease, as there is less energy to get over the 'reaction barrier.' But quantum mechanics tells us that it is possible to cheat and dig through this barrier instead of going over it. This is called 'quantum tunneling.'" Quantum tunneling states last only very, very briefly, making reactions taking advantage of them difficult. But that's where the cold temperature might help, because some molecules formed during the reaction process might be transient at room temperature, but last slightly longer at very cold temperatures. "We suggest that an 'intermediary product' forms in the first stage of the reaction, which can only survive long enough for quantum tunneling to occur at extremely cold temperatures," Heard said. In a lab, Heard and his colleagues created the same cold conditions in space, and observed reactions of the alcohol methanol with an oxidizing chemical called a hydroxyl radical, and found that these gases react to create methoxy radicals. Now, the scientists want to test other types of alcohol-related reactions under similar conditions. "If our results continue to show a similar increase in the reaction rate at very cold temperatures, then scientists have been severely underestimating the rates of formation and destruction of complex molecules, such as alcohols, in space," Heard said. The findings were published online June 30 in the journal Nature Chemistry. Editor's Note: This article was updated at 3:30 p.m. EDT to correct the values of the temperature in space, which is minus 350 degrees Fahrenheit (minus 210 degrees Celsius). In the original version, the Fahrenheit and Celsius values were switched.